America’s midterm elections earlier this month gave the Democratic party plenty to celebrate, winning them control of Congress for the first time in 12 years. And that means the event business will be busy, too. Austin, Texas-based Marquee Rents will be helping Texas Governor Rick Perry celebrate his reelection in January with a party for Perry and “14,000 of his closest friends,” says Marquee head Damon Holditch, CSEP, CERP. Texas inaugurals have traditionally included barbecues on the steps of the capitol in Austin. 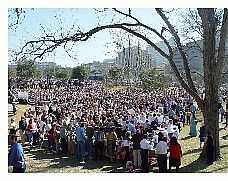 But the events broadened in scope with the 1995 inaugural, which celebrated the victory of George W. Bush as governor over incumbent Ann Richards. “And the Republicans have been celebrating ever since,” Holditch says. Los Angeles-based Ambrosia Productions has just inked a deal to produce the Jan. 5 inaugural events for reelected California governor Arnold Schwarzenegger, company head Carl Bendix tells Special Events. Following the televised swearing-in will be a tented luncheon for 400 on the steps of the state capitol in Sacramento, then a black-tie “California Dreaming” gala for 1,500 guests at the city’s convention center featuring cuisine from noteworthy restaurants throughout the state. Grammy-winning music producer/songwriter David Foster will handle entertainment. Even though the parties tied to the midterm elections can be profitable, it is the events in presidential election years that are the big bashes. For presidential inaugurations–the next one coming in January 2009–“I can bring in more revenue in one day than I do in a quarter,” notes Peter Grazzini, head of Washington-based Perfect Settings. Parties for politicians bring their own sets of rules. “The Republicans always spend more and have more formal events, but the Democrats always have the parties that are more fun though lower budget,” says Jack Luft, head of Chicago-based Hall’s Rental. Which political party makes a better client? Bendix offers a politic response: “Everything we do is bipartisan,” he says.